I am in a book club. And now I sound like every well-rounded young woman in DC (I’ve been reliably informed that everyone is in a book club). But clearly, I attend a book club of awesome. How else would I be talking about it in connection with a clever YA book like E. Lockhart’s The Disreputable History of Frankie Landau-Banks? FYI: this book club is made of SPARKLY RAINBOWS. Which is appropriate, you see, because it is the DC Forever Young Adult book club – related to that cool blog filled with snark and good times. If you haven’t checked the site out yet, definitely put that on the ‘to do’ list. Do you know another place where you can regularly find drinking games based on YA books? I didn’t think so. Anyway, awesome (have I overused that word yet?). 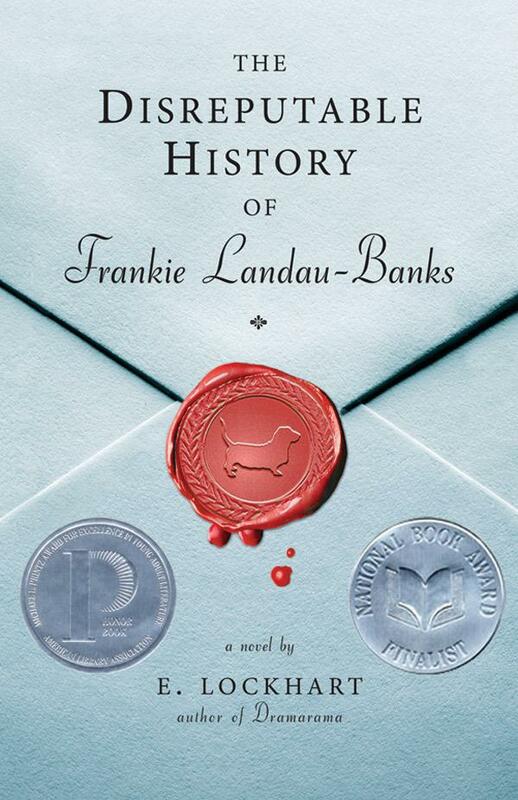 And for this month, we discussed – you guessed it – that National Book Award finalist and Printz Honor book I mentioned above, about Ms. Frankie Landau-Banks. So what is this book? It is a smart (possibly too smart) look inside the head of titular Frankie, a sophomore girl who catches the eye of the resident senior golden boy at her exclusive Massachusetts boarding school. And it’s the story of her transition – from “Bunny Rabbit” to self-actualized prank master and secret society puppeteer. Frankie’s orchestration of not only her own life but of those around her speaks of both genius and obsession. Frankie herself is brilliant, frustrated, and not sure quite what to do with her newfound popularity and position. She also hasn’t decided how to respond to the fact that she knows that there’s a secret society at school, that she can’t be a part of it, and that she wants quite desperately to maintain her ‘in’ status with the young men who effectively rule the school – and have a great time doing so. E. Lockhart has written a thoughtful novel that will put the reader in touch with their inner prankster (presuming of course that they have one). More than that, though, Frankie’s actions beg certain questions: will they think about social structures? Evaluate their self-awareness level? Make connections and choose, with eyes open, who they want to be, and who they will not be? I found the book both entertaining and wise, and I wish I had read it myself at 14 or 15. Thankfully, scheming and thinking big can be done at any age. Recommended for: pranksters of all ages, those who enjoy reading about clever protagonists, and anyone in the mood for an extremely well-written young adult novel that examines what may happen when you challenge the boundaries of the world you live in. I really enjoyed this book, especially because I think it addresses those social questions you mention in a way that teeangers can relate to. It was assigned as summer reading for our freshmen one year--the boys claimed to hate it, but I think they enjoyed discussing it anyway. Also, totally jealous of your book club! I'm jealous of your book club! I was in two over the years - the first no one read the books (except me) so we couldn't talk about them and the second rarely read books I was interested in until they read my suggestion which I loved and they were unimpressed by (Kindred by Octavia Butler). Anyway, I LOVED TDHoFL-B and wish I could have joined in on the discussion! Such a great character and a fun and interesting premise. Just discovered your blog via twitter, we're now following you! This is one of my favorite books ever. Oh my gosh, Frankie is amazing. Lovely review and I'm glad you enjoyed the book! Btw - Forever Young Adult book club sounds amazing!